At the peak of its spring blooming season, the wisteria emits a heady scent and a show of beautiful light purple cascading blooms. Unfortunately, wisteria is invasive in many garden settings, quickly growing and covering trees, sheds and other structures. The wisteria vine wraps itself around railings, gutter downspouts or anything it can find, and the weight of the quickly growing vines can cause structural damage. Cutting down the plant may not kill the roots, which may send up numerous new shoots, so you’ll have to take additional steps. Dig soil away from the base of the wisteria to a depth of approximately 6 inches. Cut the wisteria base with a small handsaw or tree branch saw as low as possible. 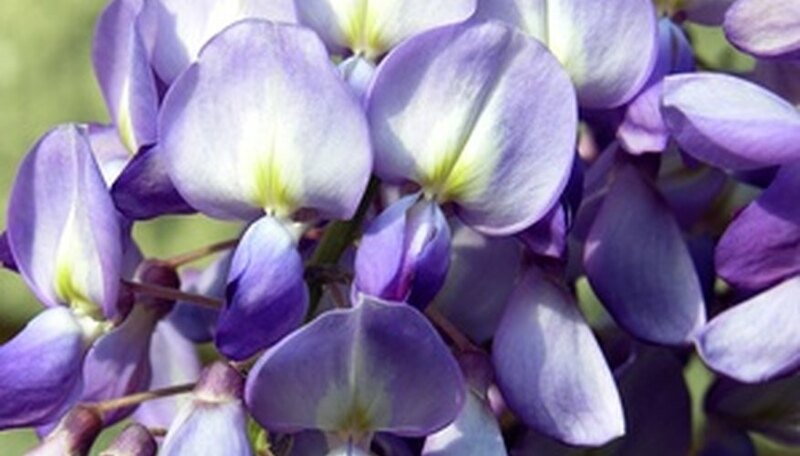 Depending upon the age of the wisteria plant, the base could be a few inches in diameter or larger. Drill vertical holes in the remaining base of the wisteria root with a 1/8-inch drill bit. Make numerous holes about 1 inch deep and approximately 1/4 inch apart. Paint liquid herbicide, such as Roundup, on the root base, working the solution into the holes. By painting on instead of spraying or pouring, only the wisteria roots will perish and the solution will not affect the surrounding soil and vegetation. Treat additional shoots, larger than 1-inch in diameter, in the same manner. Nip smaller shoots and any new shoots below ground level as soon as they appear. As the herbicide works its way down into the roots, the plant will eventually die. A mature wisteria has an extensive root system that is nearly impossible to dig out unless you have heavy equipment. Dispose of wisteria vines by bagging and removing them from your property to prevent new plants from sprouting from the disposed vines. What Can You Use to Kill Vines That Grow on Your Fence?